This post explores Personal Learning Portfolios [PLPs], an extension of a Personal Learning Environment. I review briefly PLPs for professionals, but focus on the potential and promise that PLPs hold for our students. I wrote recently about Personal Learning Environments [PLE], Personal Learning Networks [PLN] and the need for educators to develop both as a means to support their professional and personal growth and learning. A PLE can be viewed as a system that is built on the concept of creating a personalized framework for learning, tailored to one’s goals and interests. Both posts generated meaningful discussion— with many comments coming from participants in the Education Technology & Media course (#ETMOOC). The topic of the course last week was ‘connected learning’, and discourse focused on PLEs and PLNs. Several themes emerged, yet one was consistent—the idea of a place within one’s Personal Learning Environment to document and record ‘open’ learning courses and content created, learning plans, Badges earned, and/or work completed; the concept of Personal Learning Portfolio was mentioned several times. In one post, How to make Learning Visible, Helen Blunden, a workplace training consultant, wrote about portfolios for professionals and shared her learning from a recent online workshop, Professional Learning Portfolios Workshop. Helen explored how the digital portfolio can be used as a record of formal and informal learning in the workplace as part of one’s PLE, and even presented the idea to one of her clients [her post is useful for those wanting to develop their own PLP]. The comment above, feeling ‘scattered about’ is not uncommon. Yet, can we help students now, by showing them how to manage their digital lives and learning effectively by providing them with the [digital] literacy skills needed. This is where I see a Personal Learning Portfolio as an essential tool for students, both high school and college age individuals. As education becomes unbundled, fragmented, similar to a ‘jigsaw’ as described by author and professor, Richard DeMillo, a learning portfolio that is owned and controlled by the student, that establishes a student’s digital identify is almost obligatory. I suggest that a PLP could be used as a starting point for students to begin developing their own Personal Learning Environment, establishing a pathway and identity as a lifelong learner. We already are moving in the direction of ‘pieced together’ learning experience—with the prevalence of open and online courses, some which will be for credit, and some not. How will students record and potentially share their learning? What about media projects, or papers written? Or a learning plan and goals? This is where the portfolio comes in. The diagram below illustrates how the concepts work together. This diagram is adapted from Steve Wheeler’s blog post, Anatomy of a PLE. 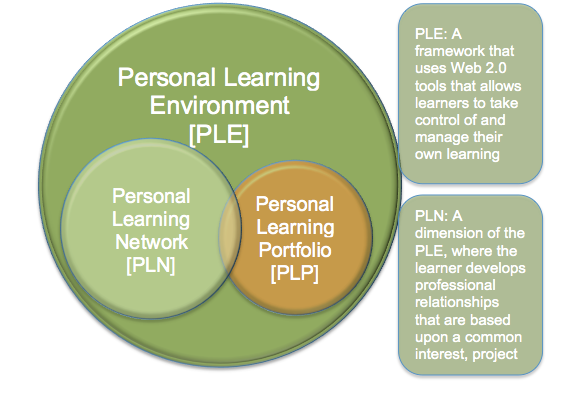 A visual representation of a Personal Learning Environment system; the personal network and portfolio are dimensions of the PLE, developed using digital tools and platforms to create a virtual space for creating, sharing, archiving, and collaborating on the Web. Adapted from Steve Wheeler’s blog post. Following is my proposed definition and vision of a Personal Learning Portfolio for students, which is not the same as an e-portfolio or electronic portfolio that was prevalent and much discussed in higher education and K-12 sometime between 2004 and 2005. The e-portfolio of the past was used primarily for the institution’s purposes, as an assessment tool for instructors to evaluate student learning, and for assessment of program and school quality, used often for an institution’s accreditation process. The tool was institution and not student-centric. After reading An Overview of e-Portfolios, from the EDUCAUSE library, it is obvious who was driving the program and for what purpose, and it wasn’t for the student (Lorenzo & Ittelson, 2005). Personal Learning Portfolio is a virtual, personal space that serves as a dynamic planning tool, archive, profile, and showcase of an individual’s lifelong learning experiences, goals and achievements. It is created by the learner, controlled by the learner, and is on a platform of his or her choice. Though the tool is geared to be an open tool that records the digital footprint of the individual, the learner controls who has access to any section of the portfolio at any given time. Helping Students to Develop a Portfolio – How? I suggest that the concept of the PLP be introduced to students in high school or at the college level, and be viewed as the catalyst or a gateway to students developing their own PLE and PLN. The PLP for students is the first step, with the learning environment and network evolving over time. Components of a PLP could include: 1) personal profile—a similar experience a student would have had in creating a profile for a social networking site such as Facebook, 2) educational record of one course, where student includes his or her learning created [assignments], and reflections [blog posts] from the course. Over time other courses could be added, including badges, earned, certificates and/or degrees, thus serving as an education record or archive, 3) blog, and 4) media projects, that students may have completed as part of the course, and this might be a place to include a video introducing him or herself. I am not the first one to come up with this idea, scholar Wendy Drexler proposed a similar idea in her research paper, The networked student model for construction of personal learning environments: Balancing teacher control and student autonomy (2010). Drexler introduces the Networked Student Model in her paper, which builds upon the concept of the Networked Teacher Model, developed by Alec Courus (2008). What is useful in the paper for educators to consider is the research project where Drexler documents a project with a small group of high school students that completed a project to build a Personal Learning Environment using digital tools around a topic of interest. The results are worth examining for those that are considering moving forward with a PLP for high school and/or college students. If education is moving towards open learning, unbundling, and a student-centric model as it appears to be, we as educators will have no choice but to support the shift and get students to take charge of their own learning, be responsible and self-directed. We can support them as lifelong learners with guidance in creating a Personal Learning Portfolio that may lead to a learning environment and network of their own. My hope is that this post may prompt further discussion or consideration among educators about personal learning environments, networks and portfolios, so at the very least, readers can be a model to students of what a lifelong learner is and does. 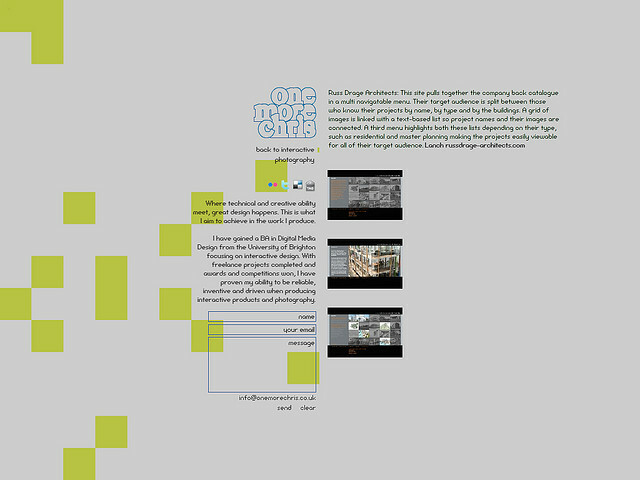 Evelyn Thorne’s e-portfolio (2013). This site appears to be maintained [actively] by the student herself. She outlines the goals of her courses, assignments, and updates the site on what she has accomplished. Her ‘logbook entries’ appear to begin with a question posed as it would have been for her studies, which she then reflects on and responds to. 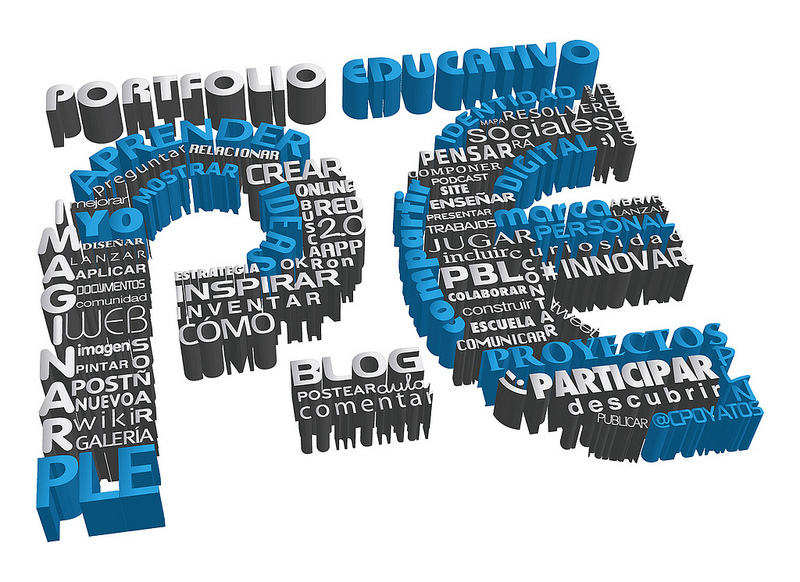 Personal Learning Portfolio, (2012). MAET East Lansing (Year 1). This site appears to created and maintained by the instructor for his or her class where the assignment is for students to create a portfolio. The page does provide a good example of clearly outlined expectations for students. This appears to be a good introduction to the concept of portfolios and creating an identify on the Web. Great blog post. Really helped me to consolidate my own thoughts about personal learning environments. This will definitely guide me while I continue the development of an application that I am writing that is, I now realize, firmly targeting both the personal learning environment and portfolio space. Thanks. Nice and helpful topic on creating personal learning portfolio for students and professionals.Evelyn Thorne’s e-portfolio is a great example. Thanks. Glad you found it helpful Monica! Thanks for referencing my post. I found PLP’s a useful tool for workplace professionals but they bring up some challenges within an organisation as you may be aware. For example, I had to strip out all the logos, brand, colours and slogans that could identify my work with the company. Their policy is that they do not endorse, support or approve of any external websites that are not approved by Marketing Brand and Legal as it may affect reputation of the company. Regardless, the exercise of collating all your work and reflecting on it (without reference to the company) was a worthwhile activity for me personally. Besides, when you go for jobs in the corporate sector, people do understand this but I go prepared to interviews with work samples. Only recently had I started writing the link to my online CV but I’m unsure if people (recruiters and companies) actually click on the link and explore the CV beyond picking out some key words that they want in a candidate and then making the final choice in the actual interview. Certainly I’ve been to many job interviews where even the people employing hadn’t even read my CV and only had a cursory glance at my work preferring to follow their Behavioural Event Interviewing Question checklist without having a real conversation. So PLPs can be used as a demonstration of skills, competence, critical thinking, reasoning and delivery – and many others. But it’s still a new concept (if it’s a concept at all – for corporate learning). This is a valuable comment that will be helpful to other readers. The reaction you get is not surprising, which is unfortunate given the quality and depth of work and experience you would have to share. I can also see the challenge of consultants like yourself that have privacy clauses regarding work done for them. Hmmm. Yes an interesting conundrum – how does a PLP fit into company cultures? Does a PLP then become a personal tool, for the benefit of the individual only? If this is the case, I can see why many would not want to invest the time in a PLP. I wonder if there might be more of an acceptance for the younger generation, the high school and college students? IT will certainly be interesting to follow as this evolves. In all honesty, for the Australian market, I can safely say that I have not heard of any PLPs (unless it is just a recording for learning – whether formal or informal – in the LMS). I think it comes down that it may not be core business for companies to upskill their staff unless it’s only for role based purposes. Certainly portability of PLPs so that you can move around from one job to the next is unheard of. Thanks again. This is incredibly helpful. I look forward to how you continue with working with this concept. I do a couple of presentations in a proseminar for our incoming graduate students in the fall. I had decided that a discussion of PLE and PLN would be very helpful, but see that the portfolio will tie it all together. I look forward to how you develop this process in the coming months. A fantastic contribution. Hi Robert. I am so glad you found this helpful! There are so many great resources in the other blog posts as well; it really helps flesh out the concept with their contributions. I agree with you, the PLP really pulls the concept together. I struggled writing this post, with so many resources and concepts, but I’m glad it pulled together.